Apparently swans can get wicked angry at each other and they fight. Look at that picture up there… they are even beautiful when they fight. But sometimes, when swans fight, it goes horribly wrong, and they get all tangled up. In 2009, brothers Alexander and Vitaly Drozdov walked along the banks of the Maza Jugla River in Latvia. 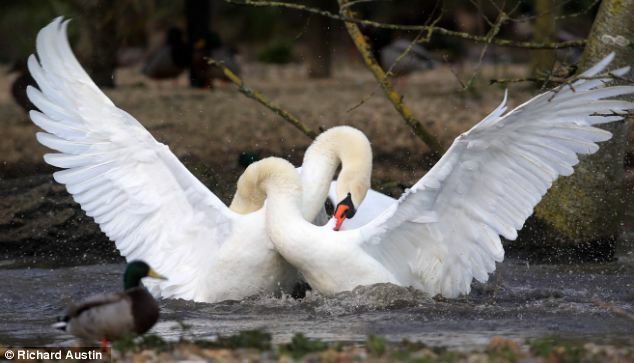 They saw two swans lying in the river, hopelessly tangled around each other’s necks and wings. The swans swam toward them as if they hoped that the humans can help them. On this day, they found the better of our species who kindly, and gently helped the birds to freedom.